The government may charge motorists for each mile traveled as higher fuel economy is translating into a shortfall in the nation's highway budget. 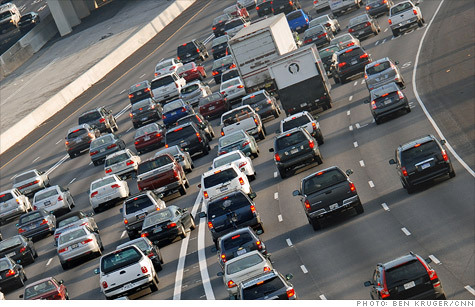 NEW YORK (CNNMoney) -- Washington lawmakers are kicking around a new idea to help raise funds to fix our highways and infrastructure: a national driving tax charging motorists by the mile. A driving tax could either replace the current 18.4 cent a gallon federal gas tax or, possibly, add to it. Because greater fuel economy is letting motorists drive more miles using less gas, the current gas tax that funds the federal government's efforts to build and maintain highways isn't generating enough money. A driving tax, officially known as a "vehicle miles traveled" tax, could close that gap. While many see a driving tax as more efficient than the gas tax, there are privacy concerns over how driving information would be collected. Plus, lawmakers opposed to the idea say it places a heavier burden on motorists from rural states. "It's a true user tax," said Ken Orski, publisher of the infrastructure industry publication Innovation NewsBriefs and a former transportation official in the Nixon and Ford administrations. "But there are serious political problems with this proposal." Although there's currently no bill proposing such a tax, lawmakers are looking into it. Earlier this year, North Dakota Democrat and Senate Budget Committee Chairman Kent Conrad asked the Congressional Budget Office to study the idea. In March CBO issued a report that said such a tax was feasible and had many advantages over a gas tax. "Because highway costs are more directly determined by miles driven than by fuel used, appropriately designed [mileage] taxes can do more to improve the efficiency of road use than fuel taxes can," the report said. The CBO report came on the heels of two congressional commissions that recommended implementing such a tax, said Orski. Last week, the publication The Hill reported that draft transportation legislation from the Obama administration included the driving tax, although administration officials told the paper that it was just an idea and was not supported by the president. The White House did not respond to a request for comment by CNNMoney. The state of Oregon is currently conducting a pilot program to evaluate the idea. Still, with motorists already paying near record gas prices, the driving tax could be a tough sell. How much it might cost: The cost to drivers would depend on how much money the government wanted to raise. To maintain the current collection level of about $35 billion a year, the tax would be just under a penny a mile for an average passenger car, said Orski. That would cost the average driver of a Toyota Camry, which gets about 380 miles per tank of gas, about $3.40 per fill up -- roughly the same as the current gas tax. But it could also be quite a bit higher. The $35 billion or so generated each year from the federal gas tax hasn't been enough to cover all the nation's road needs. Between 2008 and 2010 the federal government had to supplement the Highway Trust Fund by an additional $30 billion, according to the CBO report. So it stands to reason that if a driving tax replaced the gas tax, it might be two or three cents a mile as opposed to under a penny. Or the driving tax could be collected in addition to the gas tax. Conversely, road spending could be cut, as some Republicans are proposing. Pros and cons: The driving tax could be collected by mail following an electronic reading of a vehicle's odometer at the gas station. It could also be tabulated using on-board GPS technology that records mileage driven. The driving tax is seen as a more precise way to charge motorists for road use. While the gas tax is an approximate measure of how much wear and tear a vehicle puts on the roads, with heavier vehicles generally using more gas and so paying more taxes, the mileage tax could be based on a specific vehicle's make, year and model. A triple-axle truck, for example, causes less road damage than a double-axle truck of the same weight because the weight is more evenly distributed. So the triple axle would be charged less. Adding GPS technology enables a whole other level of pricing. Motorists could be charged different rates for travel on different roads during different times of the day. This is a form of congestion pricing, a concept that's generally seen as an effective tool in reducing traffic jams. But installing GPS technology in cars and giving that data to the government raises a whole series of privacy concerns. CBO anticipated such concerns in its report. It said GPS technology that records a vehicle's general but not specific location could ease those concerns. Also, on board computers could be used to calculate the vehicle's final bill and merely transmit that information to the government, keeping the actual path of the vehicle private. Like the gas tax, a mileage tax would also tend to have a higher impact on people in rural areas. Rural residents tend to drive larger cars and have longer commutes. Those concerns have led to staunch opposition to the driving tax from some representatives of rural states.